At MBAGuide.org, we evaluated Arkansas's 9 AACSB Accredited MBA programs. Here is some of what we found. You will find greater detail on the school summary pages, in the tables and charts below and throughout the site. Arkansas has 1 private and 8 public schools offering MBA programs. Options for earning your MBA in Arkansas have never been more flexible. Arkansas MBA programs have become adept at offering effective alternatives for you to earn your MBA, no matter your life situation or schedule. You will find at least 8 different paths to earn your MBA in Arkansas including Full-Time, 1-Year, Distance Education, Evenings and Weekends, Off Campus, Online, Part-Time, Partnership. To meet the diverse needs of Arkansas businesses, MBA programs here have risen to the challenge by offering an array of more than 9 MBA concentrations to specialize in, including Economics, Entrepreneurship, Finance, Management, Marketing, Supply Chain, Information Systems, Accounting, General Business. 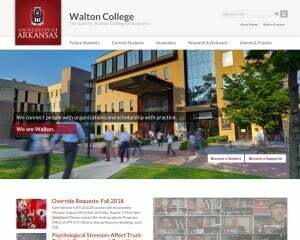 MBA Program Comparisons: Arkansas vs Online vs U.S. Chart and Graph Comparisons Arkansas's MBA Programs Online MBA Programs MBA Programs in the U.S.
To be accepted into an MBA program in Arkansas you will need a minimum GMAT score of 442.00. The average GMAT score for getting into a Arkansas MBA program is 511.05. The number of full-time faculty for MBA programs in Arkansas ranges from a low of 10 professors to a high or 119. In Arkansas MBA programs range from 63.20% of the faculty having a PhD to a 86.30% of the MBA faculty having a PhD. In Arkansas the student faculty ratio for MBA programs ranges from the lowest (best) of 14:25 the highest (less desirable) of 327:100. Average: 37:25 from Arkansas's 9 MBA Programs. For Arkansas state's MBA programs, the range for full-time enrollment is between 15 and 140. For part-time enrollment, the range is between 10 and 205. In Arkansas the percentage of students from the United States varies from a low of 70% to a high of 97%. Arkansas MBA programs offer a total of 9 MBA concentration to study including Economics, Entrepreneurship, Finance, Management, Marketing, Supply Chain, Information Systems, Accounting, General Business. Of the 9 AACSB Accredited MBA programs offered in Arkansas, 9 of them have been recognized by at least one distinguished publication (MBAGuide, PQ, US News) garnering an award as one of the best MBA programs in the country.